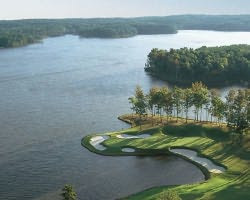 Golf Zoo's Blog: Reynolds Plantation- High end golf at it's best! This past weekend I stayed at the beautiful Ritz Carlton hotel at Reynolds Plantation in Georgia. When talking about the top east coast golf resorts I can not believe this property is not brought up in the same breath with Pinehurst and Kiawah Island as it is of equal caliber. The Resort is an hour and a half east of Atlanta which makes for easy access and boarders lake Oconee. The hotel lives up to it's name with the highest level of service, gorgeous views, and superior dining. If your looking for night life there is Gabby's on the Lake which has a sports bar feel but the majority of the guests have a few cocktails in the lobby bar that features live music daily. There are very few places to go outside the resort as it's a fairly secluded area. Now for the golf.....although Oconee and Great Waters are the top two I still loved Plantation, National, and Landing. If I had to pick just one it would be Jack Nicholas's Great Waters and the back nine in particular which nearly every hole runs alone Lake Oconee. The views are spectacular and although there are homes that can be seen from many of the fairways they are set back far enough you hardly notice they are there. I am also partial to Plantation as I shot my personal best and found myself in the 60's for the first time! All things considered this is one of my absolute favorite golf destinations and anyone who loves the game of golf needs to experience at least once.